First manufactured in 1976, Yamaha's CP70 and CP80 electric grand pianos were a practical solution to the problem of using acoustic piano in a live rock group. By putting individual pickups on each note, Yamaha created a hybrid instrument that sounded pretty good when played acoustically, but could also be cranked up through a PA with no fear of feedback. While the CP-series pianos' somewhat cantankerous amplified sound wasn't to everyone's taste, their sturdy, biting, instantly recognisable tone went down well with discerning musicians — Peter Gabriel, Eddie Jobson, and George Duke learned to love the piano, and many keyboardists (myself included) continue to use a CP70 as a writing tool. Composer/sound designer Akihito Okawa obviously shares in the nostalgia for this vintage keyboard, as he has lovingly sampled a CP80 in all its 88-note glory. The specs make impressive reading: Prominy's multi-format release comprises 24-bit/96kHz EXS24, Kontakt, and Halion versions with up to 20(!) velocity layers, plus a 16-bit/44.1kHz, 16-layer Gigastudio version comprising 2GB of samples. The two-DVD package also offers some lower-sampling-rate and 'lite' options. Loading the 16-velocity Gigastudio instrument takes a while, but that's understandable given the number of samples involved — most of the 88 notes use 16 dynamic layers plus a further 16 release triggers, resulting in a 256MB program containing nearly 2600 samples! The musical effect is superb — having so many velocity splits makes transitions between dynamic layers totally undetectable. The CP80's range is perfectly replicated, from tiny, delicate tinklings to aggressively poky loud notes, the latter just the ticket for a high-decibel belt through 'Hit Me With Your Rhythm Stick'! The Gigastudio version offers only three programs: the 16-layer full Monty, a RAM-conserving eight-velocity version, and a small 'pedal-on' layer, designed to simulate the ringing effect introduced by the sustain pedal. (I found this had a negligible effect on the sound.) Due to programming limitations, the piano's built-in mono tremolo effect can only be enjoyed by Halion users. EXS24, Gigastudio, Halion, and Kontakt 2-DVD-ROM set, $199 (around £108). Prominy +1 949 451 1753. VSL's Pro Edition covers most angles of the orchestra, but failed to include solo viola and double bass. The Viennese completists will no doubt rectify this in a future update — meanwhile, anyone who wants to put together a sampled string quartet without first remortgaging their house should be aware of Solo Strings, which, in true Christmas spirit, brings the four members of the strings family together under one roof. The solo violin and solo cello samples on Solo Strings are identical to those in Strings and Performance Set Pro Editions, reviewed in SOS March 2004. Back then, I singled out those two instruments for special praise, and can only repeat that their samples are absolutely stunning. Solo Strings ' viola closely matches the solo violin's array of musical styles, the exceptions being that the viola plays no spiccatos, grace notes, runs, or glissandi. Having suffered my fair share of tired, uninspiring solo strings samples, I'm pleased to report that this solo viola is the best I've heard. The detailed, noise-free recording captures the instrument's rich, vibrant, autumnal tone in all its glory, and release triggers add a luxurious extra dimension. The player's subtle vibrato imparts emotion without going over the top, but for all you slaves of passion there's an expressive 'strong vibrato' option. Also played with vibrato, the double bass pizzicatos might not be everyone's first choice for a jazz walking bass part, but their big, plump sound should be weighty enough for most applications. The arco samples pack power — there are some fierce bow attacks hiding amongst the diminuendos, and the sustains can comfortably handle all the subtleties of melodies, chords, and bass lines. This stately, versatile double bass perfectly complements the other three solo strings in a quartet setting. Like the violin and cello, the viola and double bass work through a large number of stylistic variations (details of which appear in the March 2004 review), the only notable omission being harmonics. Things get even better when we move on to the performance samples — the viola's 'performance legatos' offer loud, portamento, accented, and quiet options, all of which sound convincingly organic when played under the control of the VSL Performance Tool 's Horizon Legato mode. The double bass performance legatos work well too, though for some reason the loud version utilises portamento on some intervals. Altogether, the four solo instruments supply more varieties of note repetition than you can shake a stick at. EXS24 MkII and Gigastudio 5-DVD-ROM set, £296 including VAT. Time & Space +44 (0)1837 55200. As I'm sure I've said before, you can never have enough drum sounds, but sometimes getting new or original samples to play with can be tough. The nice people at Big Fish Audio have decided to help by putting together this library, which mixes some standard (and not so standard!) 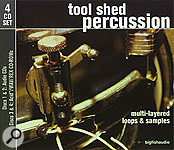 drum kits, standard percussion, and 'found' percussion into loops and hits. In total there are 49 construction kits, as well as an additional group of over 500 single hits. Each construction kit follows the standard format of a blast of the full drum loop, followed by the individual parts. The kits are a great mixture of drums, odd/exotic percussion, and bits of junk or tools. For example, the Roller kit contains a Gretsch bass drum, a metal pipe, a parade snare, sandpaper blocks, maracas, a selection of toms, a wooden block, and a slap on someone's 'large round belly'! Other sounds that sit on the stranger end of the scale include saw blades, buckets (both full and empty), tape measures, and a metal leaf rake. With such a mismatch of sounds, there is a danger that the end results could be a complete din, but the full mixes are actually really good — with a little editing these would work well as percussion beds for most musical genres, especially for soundtrack work. Tempos cover 50-170bpm, and there's also a nice mixture of time signatures, but for me it's the component hits, shakes, and crashes that make Tool Shed Percussion really interesting. These individual hits and loops can be chopped up and slotted into just about any type of rhythm track. Containing both vintage 'normal' kit, some interesting percussion, and other 'found' instruments like crisp packets, suitcases, and paint rollers, these samples can be taken as is or processed to give some some really original-sounding percussive sounds. I must also mention the excellent included booklet, which is clear, uncluttered, and full of information. Along with the track and bpm listings, it includes detailed information on all the drums and strange percussion used. Size, construction, type of beater, and age of kit are all listed. This is a real plus point that helps to underline the thought and care that the producers, Kent Carter and Pat Campbell, have put into this collection. Other sample CD companies please take note! Audio CD + Acid ised WAV/REX CD-ROM 4-CD set, £56.95 including VAT. US composer Tim Smith set up Westgate Studios to distribute his custom sound libraries. Tim's Woodwind Collection started life as a single CD, but with the addition of new instruments and articulations, it grew into a 1.52GB Gigastudio two-CD set. The expanded edition includes all the first version's samples, and the two editions are separately available — for a comparison of their contents, check out his web site. The whole clarinet family — 'E' flat, 'B' flat, and bass — is here, each instrument sounding bright and effective, with nice snappy staccatos and rock-steady sustains. Combining jocularity with a sad lyricism, the bassoon also sounds in the best of health, and a rich-toned, powerful contrabassoon provides some profoundly deep support. Great stuff, but there's more: the instrumentation here extends beyond the orchestral, supplying a recorder family (sopranino, two types of soprano, and alto), an ineffably sweet sound nowadays not much heard outside of historical documentaries. The library also has a tin whistle and a penny whistle (or flageolet), the latter contributing bends, mordents, and grace notes, very handy for programming Irish folk tunes. Overall, I was impressed by all the instruments' accurate tuning and controlled delivery, especially evident in their beautifully precise trills. Gigastudio 2-CD-ROM set, $199 (around £108). Westgate Studios +1 817 281 6212.